d+b facades want to assist in raising the bar much higher to achieve failsafe standards that remove risk for the UK cladding industry. • buyers then carry out careful weighted evaluation of the tenders to establish best value, aspiring where possible to use non-combustible, low risk products with extended warranty periods and most importantly rely upon proven past performance as opposed to stated intentions. Direct reference must be taken of all past project comparables including failures and empirical evidence of both ‘product suitability’ and the competency and technical ability of the company to deliver a quality project on time and within budget. The systems we offer are simply engineered using non-combustible, solid Aluminium that is economic, more widely available than proprietary products, in more colours, will last indefinitely, is fully recyclable and comes complete with a 25 year warranty. These assertions are readily evidenced by 30 year old examples of Tower Block Cladding that continue to look and perform ‘as originally installed’ and will continue doing so for generations to come, delivering truly sustainable regeneration. Past projects also provide reference for competency in all respects. Unfortunately there are a great many more failed cladding projects than there are successful ones. Decisions need not be based upon 1st principles testing, expert analysis/advice or stated intentions, they must be based upon fact – by direct reference to comparable past projects. Set the bar high and the industry will respond. The UK’s 1960’s high rise stock is a valuable asset, a ‘resource’ of legacy buildings. In their original state they are largely constructed of non-combustible materials that have successfully withstood severe storms and multitudes of domestic fire incidents over the past 50 years. 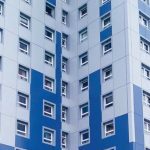 Well-designed, high quality, non-combustible cladding is multi-functional, readily adapted to strengthen, protect, arrest decay and insulate existing Tower Blocks and transform them into modern, desirable accommodation. High quality, long lasting, non-combustible cladding is cheaper than the myriad of man-made composite cladding products with (hopefully) added fire retardant that are available on the market. We offer both BR135 and CWCT performance tests to supplement the aforementioned evidence of past project performance. We offer over 100No past project examples with zero failures – we contend that this is the only information a competent decision maker needs to know in order to assure positive outcome. Check out these testimonials.